New Zealand musk Thyridia repens, one of the species previously included in Mimulus section Paradanthus, copyright Jon Sullivan. Long-time readers of this site will know that often, when I pull out the name from the virtual hat of my subject taxon for the week, I find that the greatest challenge lies in determining just what that name applies to. I knew that I was in for another one of these challenges as soon as I established that this week's post would be on the section Paradanthus of the plant genus Mimulus. Mimulus, as it is most commonly recognised, is a genus of about 120 species found in many parts of the world but with by far the greatest diversity in western North America (where about three-quarters of the recognised species are found). They are commonly known as monkeyflowers or muskflowers in reference to the appearance and scent of the flowers of some species. Because of their diversity (in a well-studied part of the world), monkeyflowers have attracted a fair bit of interest as a model system for studying processes of evolution and speciation. Most Mimulus species are herbs though some are small shrubs. However, even shrubby forms do not have extensive root systems, and they are mostly annual or seasonal; perennial forms usually die off above ground over winter, growing back from the rootstock when conditions improve. These perennial forms may also propagate vegetatively through drooping stems putting down new rootstock where they contact the ground (Grant 1924). 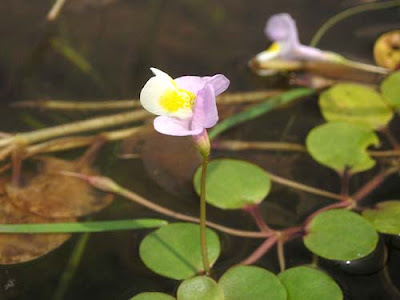 Mimulus species primarily grow in damp habitats; some will even grow in standing water. Nepal monkeyflower Erythranthe nepalensis, copyright Qwert1234. Until fairly recently, Mimulus was primarily classified in the family Scrophulariaceae. 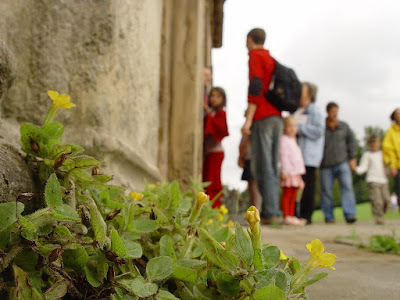 Members of this family (including Mimulus) were united by the possession of a flower type referred to as a 'scroph'; examples of plants with scroph flowers that may be familiar to you include snapdragons or foxgloves. Characteristic features of a scroph include having the calyx and corolla each fused basally. The corolla is hence more-or-less tubular at the base, then divided towards the top into five out-turned lobes corresponding to the petals (usually with two above and three below; the flower is therefore zygomorphic or bilaterally symmetrical). This flower type is primarily adapted to pollination by insects such as bees that use the lower lobe (or lip) as a 'landing ramp' when visiting the flower. After pollination, the flower develops into a dehiscent, many-seeded capsule. The advent of molecular phylogenetic analysis has established, however, that scroph-flowered plants belong to several lineages within the order Lamiales; the scroph has apparently evolved (and been lost) on a number of occasions. As a result, Mimulus is now placed in a separate family Phrymaceae with a handful of small, closely related genera. Muskflower Erythranthe moschata, copyright Nick Moyes. Mimulus was divided into two subgenera and ten sections by Grant (1924); with minor modifications, her system remained in place until recently. The two subgenera, Synplacus (or Mimulus proper) and Schizoplacus, were recognised based on whether the flower's placenta was united or divided, respectively. Four of Grant's sections were placed in the subgenus Mimulus; one of these was Paradanthus. Grant's system was not entirely phylogenetic as we would understand the term today: she did provide a diagram of suggested relationships between the sections but it did not cleanly separate the two subgenera. The section Paradanthus, in particular, was explicitly established as a convenient holding-place for a number of "small closely allied associations which, however, were not sufficiently distinct to warrant being placed in sections by themselves". Most had relatively unspecialised flowers, mostly (but not always) with funnel-shaped corollas and more or less equal lobes. Grant also somewhat unceremoniously dumped the majority of non-American Mimulus species into Paradanthus. She confessed that this section was "a collection of groups not necessarily related to one another and in all probability most of them have been derived from members of the other sections". Phak taptao Mimulus orbicularis, one of the few true Mimulus species under the system of Barker et al. (2012), from here. It therefore came as no surprise whatsoever when later phylogenetic analyses did not uphold the section Paradanthus as monophyletic. Instead, the primary division within Mimulus found by Beardsley & Olmstead (2002) was between a clade centred on western North America and one containing the majority of species from elsewhere in the world, with the Paradanthus species falling in either clade depending on their distribution (many of Grant's other sections, in contrast, do correspond to monophyletic groups). 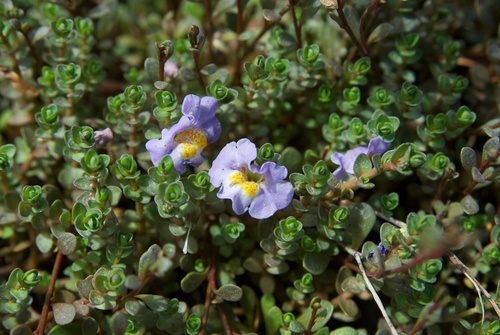 Perhaps more unexpected was the finding that Mimulus as a whole was not monophyletic. Instead, other genera of Phrymaceae were nested in Mimulus, including Phryma, a genus of one or two species found in eastern North America and eastern Asia in which the fruit is a single-seeded achene instead of a multi-seeded capsule, and Leucocarpus, a Central American genus in which the fruit is a fleshy berry. The non-monophyly of Mimulus raised the question of whether these other genera should be subsumed within a broadened Mimulus (in which case the genus Mimulus and the family Phrymaceae would potentially become identical in content). An alternative tack was proposed by Barker et al. (2012) who divided the 'traditional' Mimulus into several genera corresponding to monophyletic clades separated by the previously recognised segregate genera. 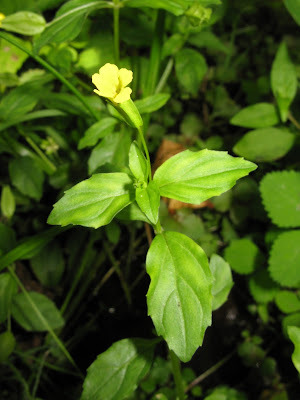 Of the 120 or so original species, only seven remain in the restricted Mimulus (species of Grant's section Paradanthus end up divided between no less than four genera). None of the western North American species remain in Mimulus; instead, species from this region are divided between the genera Diplacus and Erythranthe. Only time will tell whether this proposed reorganisation will gain acceptance. I can see there being a lot of resistance to the idea that many of the most familiar 'Mimulus' species should no longer be included in Mimulus, particularly in non-academic circles. Nobody likes being made a monkey by monkeyflowers. Barker, W. R., G. L. Nesom, P. M. Beardsley & N. S. Fraga. 2012. A taxonomic conspectus of Phrymaceae: a narrowed circumscription for Mimulus, new and resurrected genera, and new names and combinations. Phytoneuron 2012-39: 1–60. Beardsley, P. M., & R. G. Olmstead. 2002. Redefining Phrymaceae: the placement of Mimulus, tribe Mimuleae, and Phryma. American Journal of Botany 89 (7): 1093–1102. Grant, A. L. 1924. A monograph of the genus Mimulus. Annals of the Missouri Botanical Garden 11 (2–3): 99–388.